Have we been told the truth about the terror events in Norway, July 22nd, 2011? We have been led to believe that Anders Behring Breivik placed a bomb in the back of a van and blew up a government federal building (15.25) near the office of Prime Minister Jens Stoltenberg. The explosion killed eight people and injured at least 209 people. Then we are told Breivik drove undetected for 90 minutes to reach his next destination and took a ferry to the island of Utoya in Tyrifjorden, Buskerud. He then went on to shoot 77 people of the Workers' Youth League (AUF)-run summer camp dressed as a policeman. We are told he walked round the island calmly shooting these young people as they were hiding, running jumping in the water to try to get away from him or was it them? Although the media could not seem to get the number of dead at the island correct first we had 91 dead then 87 then 80 and finally the freemasonic number of 77. Several eyewitnesses saw at least two shooters. As in similar past cases there is credible evidence that the alleged suspect could not have acted alone. In a report on the website newser.com “Norway police are investigating the possibility that there were two shooters in yesterday's devastating assault on a youth camp on Utoya Island. Witnesses told police that a second man—this one not dressed in police attire—was involved in the shooting spree that claimed 85 lives, reports the AP”. "Several of the youths who were at (Utoeya) told VG that they are convinced that there must have been more than one perpetrator. Marius Helander Roset believes the same thing," saying: "I am sure that there was shooting from two different places on the island at the same time”. Young people interviewed by VG describe an additional perpetrator - who was not wearing a police uniform. He had thick dark hair and a Nordic appearance. He had a pistol in his right hand and a rifle on his back. “I believe that there were two people who were shooting”, says Alexander Stavdal. "I believe that there were two people who were shooting," VG newspaper quoted 23-year old Alexander Stavdal as saying. “I am absolutely sure there were shots fired at different locations on the island at the same time,” said Roset. “The other guy had dark hair, a gun in his right hand and a weapon strapped on his back,” Roset insists. Young man says: – There were three of them. Reporter: – Three of them that shot? Young man answers: – Three of them, yes. The attack lasted about 90 minutes and it took the Police 90 minutes to arrive. How come a helicopter with the media on board could get to the island before the police could? The brutality of Breivik and this other gunman was also described. Eyewitnesses confirm that Breivik and his accomplice made sure whoever was shot, was shot dead, including a young boy who was already dying on the ground as the second shooter fired into him again to make sure the kill. And where were the police? Where were the ‘anti-terror’ units? SWAT? Anyone? Why did it take 90 minutes before any law enforcement showed up and why was access to their helicopters blocked? 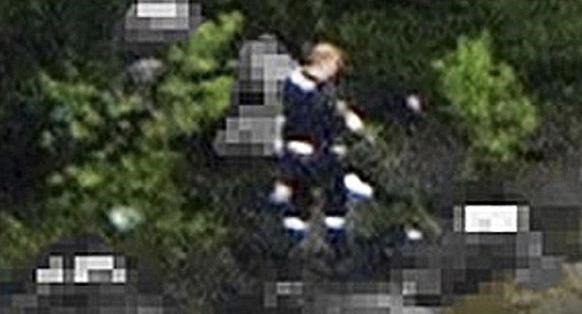 An NRK photographer who was in a helicopter took pictures of the perpetrator when he shot the victims at the southern tip of Utøya. But here is something strange with the image. If one compares the man who shoots at the southern tip on police photos in court and Breivik, there is a difference. 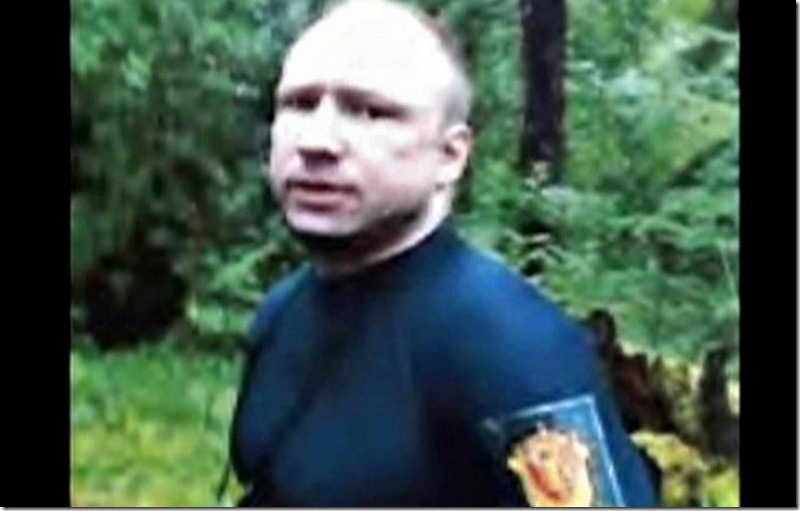 The man on the southernmost tip seems to have a bald spot, Breivik is thin haired – but had no bald spot (then). 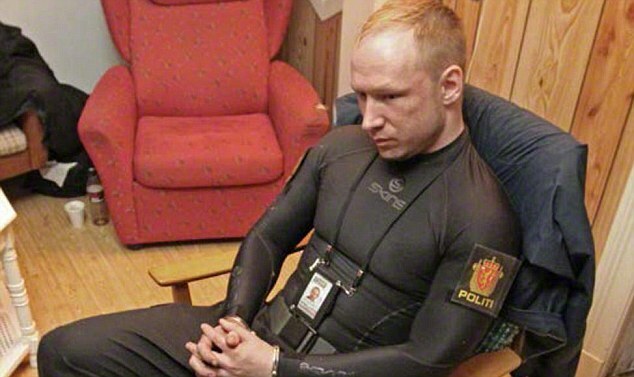 Below pictures of Breivik's Facebook photo, photo on the Island and sitting down after been arrested. Are these pictures all of the same person? 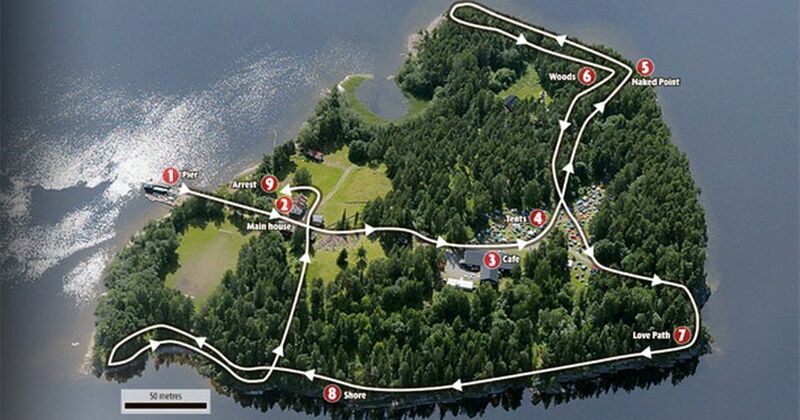 Pictures of the massacre or of the hour just before the massacre at Utøya are not available, although there were more than 500 young people with mobile phones on the island. No wonder, since the police confiscated all mobile phones. The NRK helicopter photos appear to show a parked car, dark, between the tents of Norwegian People’s Aid. They also show a white car behind the dark one and a car in the woods right by. One or two of these cars are not accounted for. Could these cars belong to the other shooters? Several youths said in the days following the massacre that the perpetrator on Utøya had shifted from police uniform to other clothes and boarded a boat. It emerged partly in an interview with Swedish newspaper Aftonbladet and Norwegian Aftenposten. Neither the police nor the 22 July Commission have mentioned this at all. Because it was not important or because it would overturn the police-explanation? 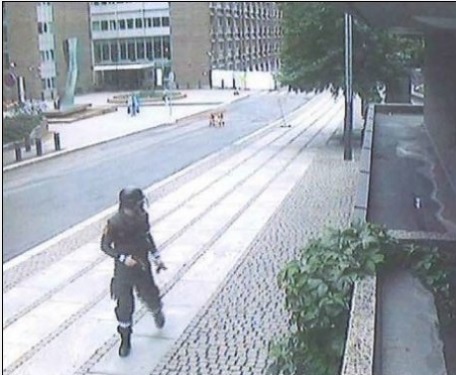 The Norway newspaper Aftenposten revealed on 26 August 2011 that there was a counter-terrorism exercise which took place in Oslo from 18 July to 22 July at 15.00 o´clock, the bomb went off at 15.25 o´clock. The bomber was reported to be 170 cm and from the Middle East. When the media showed a picture of the bomber on his way from the governmental quarters, we see a man in police uniform with a helmet and visor down. No proof that it is Breivik. The guard of the governmental quarters describes the bomber to be approximately 170 centimeters and from the Middle East. Interesting, for Breivik is 183 centimeters and from Skøyen. In the evening of 21st July a barkeeper says that Breivik drank a sweet drink in a bar in Oslo West. But this evening, at 22.30 o´clock, witnesses saw him on the Tyrifjord in a boat with another man. In addition, Breivik´s mother said he was at home at 22.30 o´clock on July 21 and watched a movie until 23:30 o´clock. As if this were not enough, the escape vehicle is run into Oslo and recorded at a tollbooth about at 23:00 o´clock. So where was Breivik on the evening of July 21? On Utøya? With his mother? At a bar? Or he drove the getaway car? Who is the man he was with? Breivik´s Facebook site was changed on the evening of 22 July after he was arrested. The first Facebook profile showed a private person and was in Norwegian. On the night this Facebook profile was changed to English at midnight and this showed him as a conservative Christian white supremacist. Who changed his site so that it matched with the crime? He could not do it himself because he had already been arrested? Friends also contradict the new Breivik characterization, Ulav Andersson telling Russia Today, it's not at all the man he knows, saying his racial antipathies were expressed in "mundane" mild terms, adding: “He wasn't opinionated, and "never came across as some kind of religious fanatic or anything." In fact, he had no defined ideology. The Norway newspaper Aftenposten stated in an interview that a man linked to Mossad was said to be in Oslo a few months before 22 July. 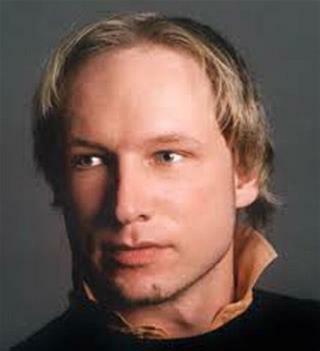 Former intelligence analyst in the US Army Trowbridge Ford stated that Breivik was part of Mossad operations in Sweden. Website Hawk of Pandora stated that there were a number of Mossad agents in Oslo in the summer and fall of 2011. The said website stated that the legendary Mossad boss Michael Harari was in a bar in Oslo under a German alias on July 22. You might think why would the Israeli Intelligence (if Intelligence means killing innocent civilians) service Mossad kill young innocent people in Norway. Firstly the Norway attack happened on July 22nd and the Israeli attack (Jewish "terrorist" gang called Irgun) on the King David Hotel in 1946 which killed 91 innocent people was also on July 22nd, coincidence? The Norwegian Labour government was against Israel’s treatment of the Palestinians and the Workers' Youth League (AUF)-run summer camp was also involved in supporting the Palestinians and had held demonstrations against Israel’s treatment of the Palestinians. The day before the event, Norway’s Foreign Minister was met with claims that Norway must recognize a Palestinian state when he visited the Labour Youth League summer camp. The Palestinians must have their own state, the occupation must end, the wall must be demolished and it must happen now, said the Foreign Minister to cheers from the audience. Norwegian Foreign Minister Jonas Gahr Store of the Labor Party has been criticized by the Israel Lobby and Zionists for comparing Israel’s treatment of Palestinians to Nazi Germany’s treatment of Jews. Store has also called for the demolition of Israel’s “Separation Wall” that runs through Palestinian territory on the West Bank, a stance that has earned him enmity and hatred from Israel’s government and their Zionist allies in the West. Store paid a visit to Utoya before the massacre. The Foreign Minister was on the island as some of the Labor Party youth were participating in a “Boycott Israel” demonstration. Also Norway decided to pull out of the illegal NATO operation and bombing against Gaddaffi and Libya in 2011. To bring Norway back into line NATO and Mossad orchestrated this massacre against the government building and the young innocent people of the Workers' Youth League (AUF)-run summer camp on the island of Utoya. An Israeli warning, support us against the Palestinians or else, side with us against Libya or else. Also Norway was withholding its $42 million contribution to Greece's bailout, calling it a waste of money. There is now a widespread belief that the terrorist attack against Norway was engineered to shock peaceful Norway, a nation where police generally still patrol the streets unarmed, into adopting the police state tactics of the United States, Israel, Britain, and other Western nations. Breivik being at the island was probably there to kill (Labour Party) Prime Minister Jens Stoltenberg who wasn't at Utoeya Island for some reason. Here is a view of the Norway event as false-flag terror given by US commentator Wayne Madsen. Madsen states, “Israel’s most secret and tried-and-true weapon is the “false flag” terrorist attack.’ That’s true enough, but does it apply here? In case it does, here is Wayne Madsen’s conclusion: Mossad is a master at false-flag terrorist attacks designed to alter perceptions and punish opponents of Israeli policy. The fingerprints of Israeli intelligence are all over the 9/11 attacks on the United States, the 3/22 train bombings in Madrid, the 7/7 transit bombings in London, and, now, the 7/22 attacks in Norway… While the Israeli-influenced corporate media has droned on and on about the dangers of Islamist terrorism, it is now obvious that the major threat to public safety comes from the State of Israel, a rogue nation that does not hesitate to murder the innocent to achieve its sordid political aims”. “So let us fight together with Israel, with our Zionist brothers against all anti-Zionists, against all cultural Marxists and multiculturalists.” - Anders Behring Breivik. This quote, from Breivik’s startling manifesto, has been completely repressed by the Zionist media. Truth-telling is a task that we must all embrace. We have to bury the nonsensical theory of the “crazed lone gunman” to explain politically motivated assassinations and terror attacks because it is simply not true. State political conspirators are responsible for the attacks in Oslo and other terrorist attacks in America and the Western world.